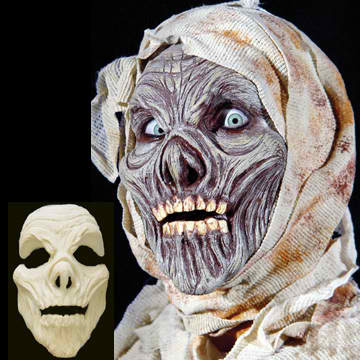 This mummy mask, made of soft foam latex, was sculpted and produced by Hollywood makeup artist Larry Bones. This mask is movie quality, is very realistic, has extremely thin edges and moves like real skin. Comes with teeth already sculpted into the mask.